From childhood into adulthood, M&Ms have always been my favourite candy. I am hardly alone in this, as M&Ms are the best selling candy in the United States. 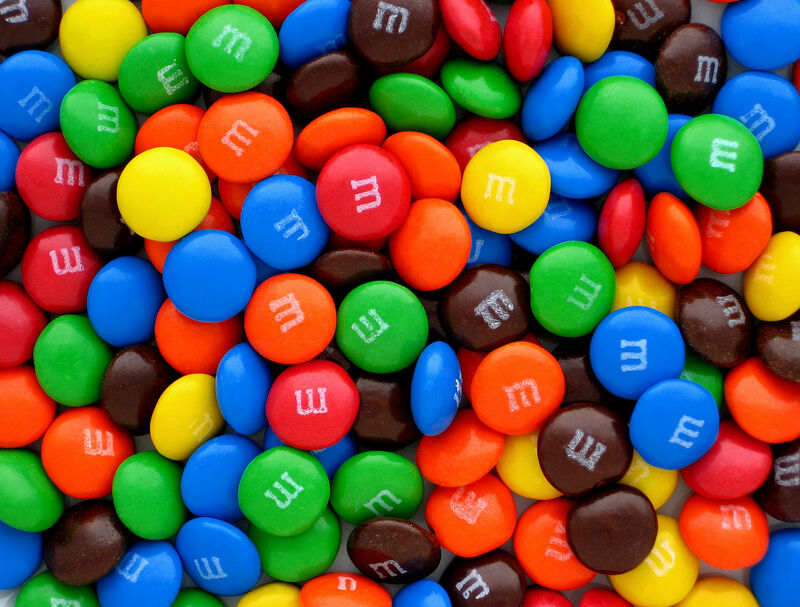 In 2015 alone over $1 billion worth of M&Ms were sold. What makes this even more remarkable is that M&Ms have been phenomenally popular for decades--they are hardly a new candy brand. In fact, the candy coated chocolates turned 75 this past Thursday. It was on March 3 1941 that M&Ms were born. While M&Ms have been popular for most of their history, their creation is shrouded in legend. What we do know is that they were developed by Forrest Mars, Sr. Forest Mars was the son of Frank C. Mars, the legendary chocolatier and founder of Mars, Incorporated. Forest Mars went to work for his father not long after graduating from Yale University with a degree in industrial engineering. Unfortunately Frank C. Mars and Forrest Mars did not get along particularly well. Eventually Forrest Mars left for England. There he developed the Mars Bar and Maltesers. For a time he worked for Nestlé and the Tobler company. According to legend , Forrest Mars was in Spain during the Spanish Civil War of 1938 and 1939. It was there that he saw soldiers eating candy coated chocolate pellets. Forrest Mars took this idea back to the United States where he received a patent for what would become M&Ms on March 3 1941. While this legend is often told, there are some reasons to doubt its veracity. Quite simply, even as the Spanish Civil War was underway, there was a candy being marketed in the United Kingdom that resembled M&Ms a great deal. Smarties were introduced by York based candy company Rowntree's in 1937. Even in the early days they were sold in cardboard, cylindrical tubes. It appears that Forrest Mars knew George Harris, the head of Rowntree's. What is more, it seems very likely given their introduction in 1937 that Forrest Mars was aware of Smarties. While it is possible that the legend about the Spanish Civil War is true (and, if it is, it seems possible that the candy coated chocolates that the soldiers were eating were Smarties), it also seems possible that Forrest Mars got the idea of M&Ms from Smarties. Mars, Incorporated has always strenuously denied that Smarties inspired the idea for M&Ms, preferring to accept the Spanish Civil War legend. Regardless, Forrest Mars entered into a partnership with Bruce Murrie, son of Hershey Chocolate Company's president William F. R. Murrie, to found M&M Limited, later renamed Food Manufacturers Inc. The partnership was particularly ideal at the time, as it allowed M&Ms to be made with Hershey's chocolate, this at a time of rationing. As to the candy's name, it came from the last names of the two founders of M&M Limited--Mars and Murrie. M&Ms were originally sold in cardboard tubes (not unlike Smarties). M&Ms were originally made in the colours red. green, yellow, brown, and violet. Originally the candies were sold to the military, who had need of a chocolate candy that would not make a mess. M&Ms proved very popular during World War II, so much so that the increased production warranted a move from their original plant at 285 Badger Avenue in Clinton Hill, Newark, New Jersey to a bigger one at 200 North 12th Street in Newark. Following the war M&Ms were finally made available to the general public. Given their popularity with soldiers serving in World War II, it should come as no surprise that they continued to be very successful. In 1948 Forrest Mars bought out Bruce Murrie's share in the company. It was that same year M&Ms stopped being sold in cardboard tubes and began being sold in the now familiar brown bag (Peanut M&Ms would later be sold in yellow bags and other varieties in yet other coloured bags). In fact, M&Ms were so successful that a number of imitators sprang up. To separate M&Ms from their imitators, in 1950 a black "M" was printed on them. That same year violet M&Ms were discontinued in favour of tan M&Ms. In 1954 the black "M" on M&Ms was changed to the more familiar white "M" that continues to be used to this day. That same year saw the introduction of the long running advertising slogan "Melts in your mouth, not in your hands", as well as Peanut M&Ms. With the introduction of Peanut M&Ms, the old M&Ms, which were chocolate in a candy coated shell, became known simply as Plain M&Ms. Curiously, Peanut M&Ms were originally made only in the colour tan. It was in 1960 that at last Peanut M&Ms were made in red, yellow, green, and brown as well. In 1960 Almond M&Ms were briefly introduced to the market, but they were quickly pulled. In 1964, after the death of his father, Forrest Mars, Sr. took over Mars, Incorporated and merged it with his own company, Food Manufacturers Inc. The year 1976 would see the first major change in M&Ms in quite some time. In the early Seventies a study conducted in the U.S.S.R. linked the dye known as Red No. 2 to cancer. While it was never proven conclusively that the dye caused cancer, the Federal Drug Administration went ahead and banned its use in 1976. Even though M&Ms had never been made with Red No. 2, Mars Incorporated removed the colour red from M&Ms lest customers become concerned about the product's safety. It was replaced with orange. It was in 1982 that Paul Hethmon, then a freshman at the University of Tennessee, started a campaign for the return of red M&Ms as a joke. He formed the "Society for the Restoration and Preservation of Red M&Ms" as a parody of the sort of mass mailings that were so common in the Eighties. As it turned out, the Society for the Restoration and Preservation of Red M&Ms took on a life of its own, and while Mr. Hethmon had meant it as a joke, there were many who seriously wanted the return of red M&Ms. The Society for the Restoration and Preservation of Red M&Ms received coverage in Seventeen Magazine, The Wall Street Journal, and other news outlets. Paul Hethmon was even interviewed by Charles Kurault of CBS News. It was in February 1987 that red M&Ms were finally returned to store shelves. While red M&Ms were returned to the market, orange M&Ms continue to be made to this day. The re-introduction of red M&Ms would not be the last change in colours for the candies. In 1995 tan M&Ms were replaced by blue M&Ms. Of the various colours, only brown, yellow, and green have continuously been part of the product line from the very beginning. Over the years new varieties of M&Ms have been added. It was in 1988 that Almond M&Ms returned for the first time since 1960 as part of a limited release for only Christmas and Easter. In 1992 Almond M&Ms were added to the standard line of M&Ms. The year 1991 saw the introduction of Peanut Butter M&Ms. Crispy M&Ms were introduced in 1999, but would be discontinued in the United States in 2005 (although they continued to be made elsewhere). They were reintroduced in 2015. In 2010 Pretzel M&Ms were introduced. In 2000 Plain M&Ms were renamed "Milk Chocolate" M&Ms, although there was absolutely no change to their flavour. Over the years there have been yet other varieties of M&Ms to hit the market. Today M&Ms are well known for their computer animated "spokecandies", anthropomorphic M&Ms. The most famous M&Ms characters, Red and Green, were introduced in 1995, but there were precedents for M&Ms' "spokescandies" from very early in the candy's history. The 1954 television commercial introducing both Peanut M&Ms and the slogan "Melts in your mouth, not in your hands," included an animated sequence featuring an anthropomorphic Plain M&M and an anthropomorphic Peanut M&M who dived into a chocolate filled swimming pool. The original animated M&Ms differed from their modern counterparts in that their "Ms" were placed above their eyes and mouths. In 1960, with the introduction of Almond M&Ms (which would not remain on the market long), there would be another animated commercial in which anthropomorphic M&Ms dived into a chocolate filled swimming pool. This commercial is notable in that the animated M&Ms were much closer in appearance to their modern counterparts. The late Sixties and early Seventies would see a series of commercials in which someone's hands were covered in chocolate from a candy bar. In these commercials an animated Plain M&M and an animated Peanut M&M would show up and explain to them how they could avoid "chocolate mess" by eating M&Ms, which "melt in your mouth not in your hands." Among the scenarios in the commercials were one featuring a Tarzan parody, another featuring a little boy and his mother, and yet another featuring gamblers in the Old West. What is significant about these commercials is that they featured a red Plain M&M and a yellow Peanut M&M, although their personalities were different from the modern day Red and Yellow. In the mid-Seventies there was an ad campaign for M&Ms featuring a character called "the M&Ms Man" with a jingle set to the tune of "The Candy Man" from the movie Willy Wonka & the Chocolate Factory. At least one of these commercials featured an animated version of the M&Ms Man along with animated, anthropomorphic M&Ms. Starting around 1983 there would be a series of commercials featuring the slogan "All the world loves M&Ms" alongside animated, anthropomorphic M&Ms. Given red M&Ms were not being made during this period, the commercials featured M&Ms characters in other colours (for instance, a 1987 commercial featured a brown and green M&M). The early Nineties saw more commercials featuring M&Ms characters, such as a 1993 commercial featuring anthropomorphic M&Ms at "M&Ms Chocolate Camp". Significantly the lead characters were Red and Yellow M&Ms. It was in 1995 that the modern day, computer generated M&Ms characters were introduced. The initial characters were sarcastic and cynical Red (a Plain M&M) and gullible, naive Yellow (a Peanut M&M). Jon Lovitz and John Goodman initially voiced Red and Yellow respectively, later to be replaced by Billy West and J.K. Simmons. Later in 1995 they were joined by cool guy Blue (an almond M&M), who was voiced by Phil Hartman until his death. Robb Pruitt then took over voicing Blue. Over the years Red and Yellow would be joined by other characters. Green, the first female M&Ms character, was introduced in 1997. She has always been voiced by Cree Summer. Orange (a Pretzel M&M) was introduced in 2010 with the introduction of Pretzel M&Ms. Ms. Brown (originally a Dark Chocolate Mint M&M) was introduced in 2012. She is voiced by Vanessa Williams. The M&Ms characters have proven very popular. Not only have they appeared in commercials for over twenty years now, but there is a good deal of merchandise featuring their likenesses and they appear on packages of M&Ms. M&Ms proved popular with GIs during World War II. They would continue to be popular after being introduced to the public in the years following the war. They are now the best selling candy in the United States and have been for some time. It seems doubtful that their popularity will decline any time soon. They will almost certainly be around for another 75 years.